Parquet flooring—the real thing, which uses solid hardwood blocks to create geometric patterns—first became fashionable in 17th-century France, when the aristocracy gradually replaced the marble floors in their chateaux with intricate wood parquetry. Even Louis XVI joined the trend, bequeathing us the iconic pattern still known as Parquet de Versailles. Gorgeous though they may be, many of those French parquet designs—each named for the chateau where it was created: Chantilly, Aremberg, Fontainebleau, and so on—are too elaborate for a modern home. Notable exceptions to this rule are two of the earliest and most enduring parquet patterns: chevron and herringbone. 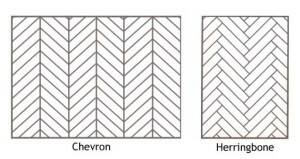 The difference between these closely related zigzag designs lies in way the end of each block is cut—at an angle for chevron, on the perpendicular for herringbone—which is more easily illustrated than described. As you can see, with chevron the zigzag is smooth and continuous, which gives the pattern a slightly more formal feel, while herringbone’s broken zigzag has a more relaxed, even rustic effect. I’ve noticed both these parquet patterns in a number of recent residential projects. Here are three I think use the distinctive hardwood flooring in particularly successful ways. 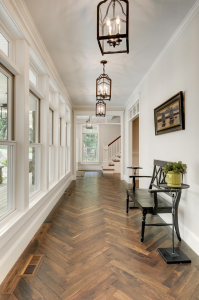 The first is a magnificent American black walnut herringbone floor in the reception hallway of a new house in Minneapolis designed by Divine Custom Homes. “The place was inspired by Hamptons beach houses from the ’50s and ’60s,” says firm principal Jeff Warren. “Herringbone was used in this entry space because it sets the stage for the rest of the house. Visually, the pattern leads you down the hall to a special family portrait at the other end.” The walnut blocks were cut with a circular saw so they would look old and rustic. The blocks were hand laid and sanded before receiving two applications of oil to bring out the natural beauty of the walnut followed by water-based polyurethane for a durable finish. The word “parquet” derives from the Old French parchet (the diminutive of parc), which means “small enclosed space” and was used to describe the decorative wood flooring surrounding thrones and other seats of honor to demarcate them from the rest of the room. Chicago interior designer Michael Abrams evokes parquet’s patrician origins in the stair hall of a 1920s Gold Coast limestone mansion he recently renovated. 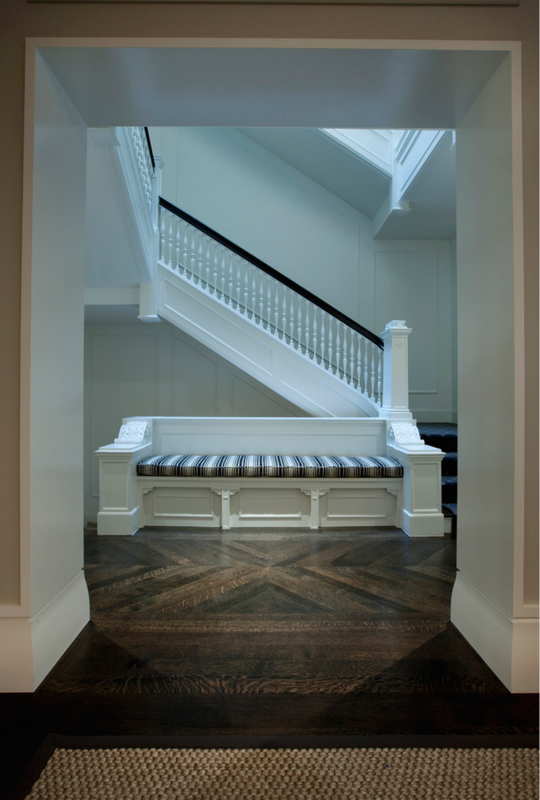 He uses 4-inch-wide white-oak chevron flooring to set off the original staircase and integrated bench, creating an elegant enclave that’s an invitation to stop and sit. 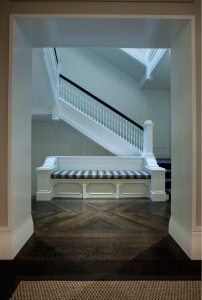 The white painted millwork contrasts perfectly with the dark custom satin stain finish on the floor, while the symmetrical chevron pattern acts like a plinth for the imposing seat. Flooded with natural light from a skylight above, the whole composition is handsome and imposing—even dramatic—without being overwhelming or pompous. My final example of parquet put to stylish contemporary use is in an early-1900s Brooklyn townhouse recently renovated by Horrigan O’Malley Architects. “We installed new herringbone floors throughout the house—they’re treated like carpet,” says firm principal Christa Horrigan. 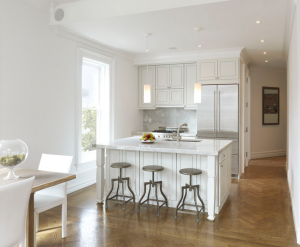 “There’s a lot of original Victorian parquetry in the area’s brownstones, but herringbone is between traditional and modern; it’s both old and new, which makes it very flexible.” The architects used 2¼-inch-wide white-oak strips finished with a dark golden stain that compliments the mostly white interiors. Areas of herringbone are framed with 14-inch-wide plain plank borders, and the pattern is oriented so it either runs in the direction of circulation or flows toward a window, “which makes the room appear larger,” says Horrigan. Even in the kitchen, the warm-toned herringbone brings a delicious note of French courtly elegance to what is basically an unpretentious Brooklyn family home.